Oh well... true, i saw a 2 segment retracement to 1219 before monday last week, and to no surprise, volatility brought it down even further to tease the 1180s again. The good thing is that the 60mins chart always responded nicely. Lower time frames behaved like a charm too. Now what to expect? We'll stick to a still negative bias overall with a high probability the worst is behind us. Does that mean a recovery is under way? If so, it is still well hidden. Again we recommend lower time frames here. on this chart, we'll watch the 1219 resistance which could at last open the way to 1250. Until then, we can only expect more of the same uncertainty... We've got a slight upper bias for now, so we may have not to wait too long. Entropy is improving but no clear pattern otherwise, and this until the 2 spikes are fully digested. I would recommend waiting a few more days for volatility to reduce. Bars are still yellow after all, and so do not express any strong recovery yet. Still some negative pressure here despite higher lows. The market may congest below the key 1250 level which remains crucial to a long term rebound. Options (RUT): Vega is sky high but no change to our condor positions. Last week I cautiously warned to wait for the drifting to stop on a strong support level. We've touched it now at 688, exactly where anticipated, yet we have no indication of a solid recovery coming in the next few days. I even doubt any news from Washington DC can really bring confidence in the market in the short term. EURUSD: €/$ is also hesitant with $ making some gains to a target level around 1.457 that was quite visible in intraday charts. On our time frames, there is a chance 1.464 acting as a strong resistance in the short term and $ then making further progress. In absence of shock, congestion would be the favoured scenario. Knowing the bailout plan is about to be finalised, a shock is inevitable and a breakout either way is possible. 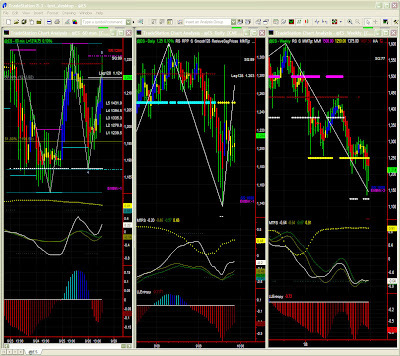 I shall again revert to a 233/610/1597 tick charts until we retrieve some visibility. After bouncing on 688, ER reached the highest boundary of this price segment, the next one possibly taking prices to 719. Yet, we have no indication of much energy capable of taking ER to the high 710s, and certainly not higher than the next segment boundary i.e. 719,(again unless new surprisingly positive information on the bailout plan shakes current dynamics). Despite the high volatility environment, this is still a drifting environment we're having at the moment. The good news is that 688 may be the support level the market needed, the bad news being that there is no real buying at this stage yet despite the trading restrictions. ER could therefore congest with some price bursts here or there until volatility subsides. After 2 extraordinary weekd in terms of volatility, we'll watch the market calming down and 750 being passed to ge back into it. Obviously, it's not so bad for condor players like us at the moment despite the sky high vega. It may sound a little too early, but one can start thinking about tuning positions a little more delta positive.